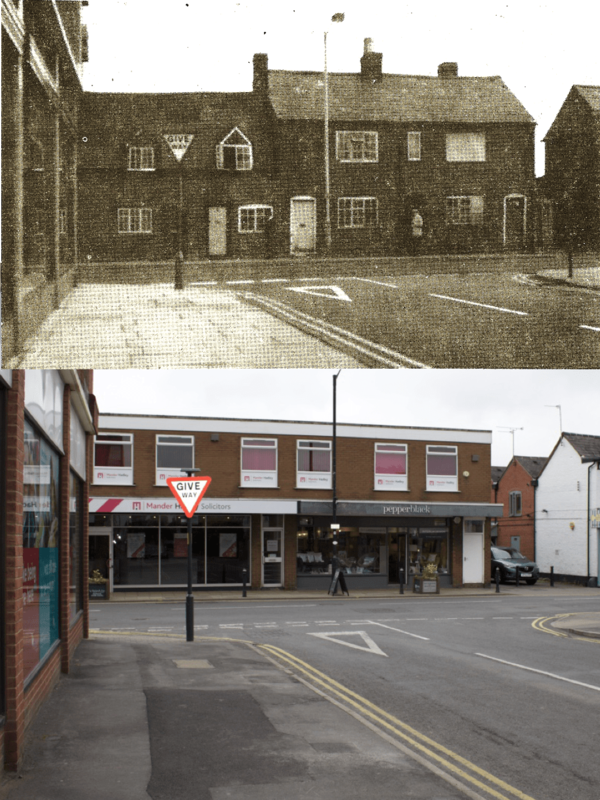 Here we see yet another Then & Now pairing which illustrates the scale of the demolition along Warwick Road in the 1960s and 1970s. This scene shows a row of houses at the junction of Randall Road and Warwick Road, taken in 1971 by John Drew for his book Kenilworth – A Manor of The King (Pleasaunce Press, 1971). Local historians and KHAS members, like John Drew and Rob Steward, were extremely proactive in ensuring a photographic record was made of properties earmarked for demolition. Were it not for photographic collections like these we would have no images of whole swathes of the old town centre before it gave way to the swingeing post-War modernisation-mania. Compared to other such photos in this series, the case for preserving these particular houses is perhaps less clear cut. Nevertheless, the houses on the left do look the oldest of the grouping, with their tiny doors and dormer windows suggesting buildings older than their façade suggests. Buildings similar to these can be found elsewhere in the town, some of which survived long enough into the era of conservation to be listed in the early 1970s. For example, numbers 23 & 25 New Street were Grade II listed in 1971, a few short years after the properties in our picture were demolished, described as “C17 or earlier, altered. Whitewashed brick, tiles. One storey and attics, 3 casements, 4 hipped casement dormers. 1st floor band to No 25. Nos 23 and 25 form a group”. The needs of the booming consumer sector of the 1960s were deemed to outweigh the need to preserve 16th and 17th buildings, and these properties, like many others, were replaced by flat-roofed commercial units. Before we become too judgemental of these decisions, perhaps it’s worth reflecting on the demolitions of the present age to address the needs of our time, namely affordable housing.